Like its cousin, the Black Russian, the White Russian drink did not originate in Moscow. Instead, it's named for its primary alcoholic ingredient, vodka. The white in the name refers to its color, more specifically to the cream that gives it a cloudy, thick appearance that is reminiscent of a glass of milk. This drink made its debut sometime during the 1960s, although it is unclear where it first appeared. 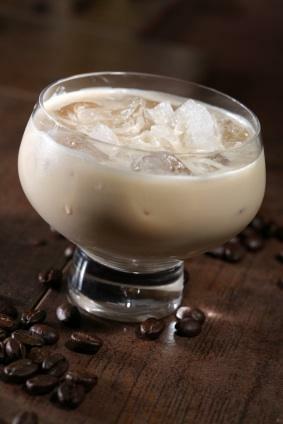 The traditional White Russian takes just three ingredients: vodka, Kahlua and cream. The vodka can be just about any vodka you wish, but it's best to stick to unflavored if you want to experience the true White Russian. Kahlua is a Mexican liqueur that tastes a lot like coffee. If you don't have any Kahlua on hand, you can substitute Sabrosa, Tia Maria or another alcohol with a similar taste. If you don't have cream, you can use regular milk. Pour cubed ice into an old fashioned glass. Add two ounces of vodka. Add one ounce of Kahlua. Add one ounce of cream. As you can tell, this drink is very easy to make. If you'd like to make a larger batch, just continue with the one to one ratio. Once you've gotten good at making the White Russian drink, it's time to mix it up, literally and figuratively, by trying some interesting variations. Make your drink a bit sweeter, and also a little bit healthier, but using light cream and vanilla vodka. Give your drink a holiday flair by substituting eggnog for the cream. Substitute tequila for the vodka to give your drink some extra bite and a little more alcoholic flavor. You can also make these related drinks which use similar recipes to the White Russian. Take an ounce of Kahlua, an ounce of vodka and a shot of espresso, and put them all in a shaker with ice. (You may wish to let the espresso cool down to room temperature first.) Shake for a ten count, and then pour the mixture into a martini glass and add one half ounce of Amaretto or walnut liqueur on the top. Be careful with this one. It has quite a kick! It also has a very heavy coffee taste since it has coffee liqueur and coffee in it. This can be too much for people who have a low tolerance for caffeine. This drink goes down like a meal. It takes four ounces of coconut water, an ounce of Kahlua and an ounce of dark rum (like Meyers). To mix it up, combine the Kahlua, coconut water and rum in a shaker, and shake for a count of 20. Pour the result into an iced pint glass. Garnish your drink with coconut shavings, or, if you're feeling festive, serve it in a hollowed out coconut. Some people like to add an egg white to this drink. Do so at your own discretion because it can be an acquired taste. You can also experiment with different flavors and garnishes on your own. After all, that's how new cocktails are invented all the time. Someone with an idea decides to take the initiative to create them.